Zimbabwe news !!! The latest and breaking news from Zimbabwe !! : President Mugabe's daughter forced into marriage !!!! President Robert Mugabe's only daughter, Bona, was allegedly rounded up to marry her new mysterious husband, Simba Chikore due to unperturbed pressure from her mother and the ZAOGA church, The Telescope News has learnt. It is now coming to light, that First Lady, Grace Mugabe, railroaded the marriage ceremony following concerns that Mugabe's health and age, might result in him failing to see Bona tie the knot, therefore she wanted to fulfill her husbands wish. We also have it on good account, that the newly weds are also under severe pressure to make their first baby, as it is also Mugabe and Grace dream to "hold and see their first grandchild" as a couple together and alive. Grace is already a grandmother, after her first born son Russell, to her first husband Stanely Gorereza recently became a father. The baby boy from Russell and the mother called Gladys is called Taponeswa. Meanwhile, Stanley, is still posted outside the country in what many see as involuntary diplomatic service. "Amai (Grace) is the one who really fasttracked the wedding," said a senior official at ZAOGA. "She wanted her daughter to wed before anything happens to Baba (Mugabe). Bona herself is understood to have opted to wait, a year or two to pursue her career, but Amai said it was not urgent and she needed to get married in early 2014. 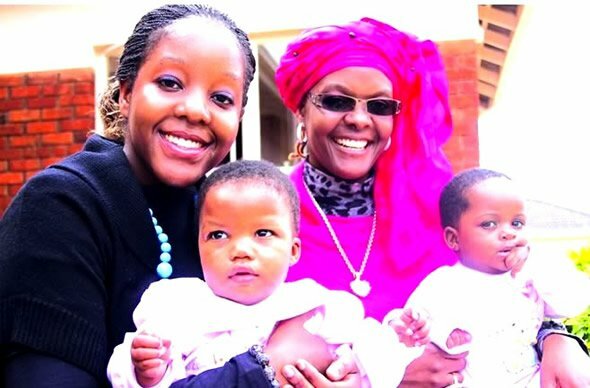 We also know that, she has revealed to Bona's mother-in-law, who is one of our reverends, to pray for their home to be blessed with a child as soon as they get married, 'nekuti tamirira muzukuru akakosha' (We are now awaiting for a special grandchild)." Not everyone who courted Bona, has ended up being lucky like Chikore. The merciless Central Intelligence Organisation (CIO) agents, have previously pounced on other young men who attempted to win her heart. One such grapevine example refusing to die out, is a theory about the son of a very popular Zimbabwean and African artist, whom the rumor mill maintains could have lost his life, by refusing to "back off" from Bona. Intelligence briefings this week, are all but indicating that Bona's husband himself could potentially be an operative of Mugabe's feared spy agency, as it is almost impossible for an ordinary man to become so close to the first family, unless they have secret service links, our informants have said. Chikore who has been reported to be a qualified pilot, has of late experienced tough media scrutiny, with some foreign media houses insisting that, he may not be a pilot after all. It had earlier on been on record that Chikore is a pilot, possibly for Emirates or Qatar Airways. However, reports from London say both airlines denied that Chikore is an employee there. Moreover, people in the aviation industry in southern Africa "have never heard of" Chikore. Bona's wedding our sources pointed out that, is remniscent of Mugabe's own to Grace in 1992. Mugabe also leap-frogged his second marriage, which took place soon after the death of his first wife Sally. The country's former beloved first lady died from kidney failure. Mugabe recently made shocking revelations in a frank interview with South African broadcaster Dally Tambo for his People of the South series, showing how he was under pressure to marry Grace and make love to her, because her mother also called Bona wanted to see her grandchild before death. "After Sally was gone it was necessary for me to look for someone and, even as Sally was still going through her last few days, although it might have appeared to some as cruel, I said to myself well, it's not just myself needing children, my mother has all the time said, ah, am I going to die without seeing grandchildren,?" said Mugabe last year. "So I decided to make love to her. She happened to be one of the nearest and she was a divorcee herself, and so it was. We got our first child when my mother was still alive." Mugabe seems to love and favour Bona of all his children, and describes her as "very obedient" and "absolutely trustworthy". Married woman cheats with a policeman !! !